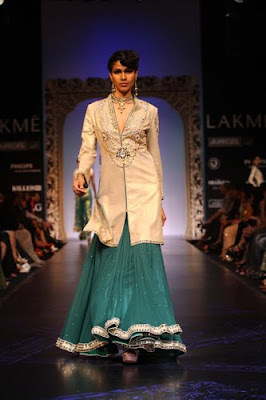 Another of the big name designers who showcased a collection at the Winter 2010 Lakme Fashion Week in India was Satya Paul. I've previously posted photos of the Satya Paul "Maya" collection of saris and thought they looked beautiful, so not surprisingly I like most of outfits in this latest collection! This collection is called the "Bridal Tarot Line" because it's inspired by tarot symbols like Empress, Lovers, Wands and Chariots - I personally have never really been into tarot cards so don't quite see the link but if you can see the tarot in these gorgeous outfits leave a comment and let me know! I really like these three green outfits, I've always been a fan of this green and cream colour combination and for bridalwear it's a colour combo which I've not seen many real brides wearing. Here we have a bit of bollywood on the catwalk in the form of actress Shruti Haasan - don't be surprised if you don't recognise her...she's pretty new and I wouldn't have known it was her if I hadn't read it somewhere! The rest of the collection was a step away from bridalwear and saris with these two dresses and a chic-looking jumpsuit. 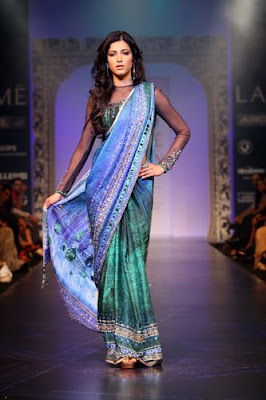 You can view more from this collection and even a video from the catwalk at the Lakme Fashion Week website. the last few look like warrior type of outfits. 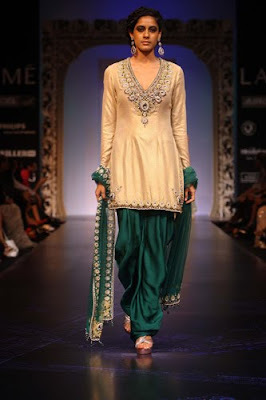 as for the green and cream colour scheme, doesn't it remind you of the HSY collection at PFDC show earlier this year?